Declines in academic engagement and psychological well-being, which are common for many adolescents, may be exacerbated among some African American adolescents because of exposure to racial discrimination. Experiencing racial discrimination experiences has been linked to lower academic expectations, achievement motivation, and performance among African American adolescents. These experiences have also been linked to decreases in self-esteem and psychological well-being. Yet, not all African American adolescents who experience racial discrimination experience declines. While discrimination can have negative effects on the development of minority children, some develop adaptive qualities to better cope with discrimination. These qualities can contribute to psychological well-being and better academic outcomes. At the family level, both culturally specific parenting, including racial socialization (i.e., parents’ messages to their children about race), and general parenting practices are related to minority child development. It is important to identify factors that help explain variation in the association between discrimination and adolescents’ academic outcomes and psychological well-being. This research brief reports on a study that examined whether there were groups of families with different combinations of parenting, specifically involved-vigilant parenting and racial socialization messages. The study further analyzed whether parenting profiles, racial discrimination, and adolescent gender independently or interactively predicted adolescent outcomes. Involved-vigilant parenting is a parenting process that includes inductive reasoning (parents provide explanations for rules and encourage children to think about the consequences of their actions), mutual problem solving (parents and adolescents discuss problems and developing solutions together), and monitoring (parents’ knowledge of their children’s actions, whereabouts, and peer relationships). Together, these characteristics assess aspects of parents’ responsiveness to and behavioral control of their children. Racial socialization includes implicit and explicit messages about personal and group identity, relations within and between groups, and the importance of race and racial stratification. Boykin and Toms have suggested that African Americans experience a triple quandary: they must navigate mainstream, cultural, and minority experiences. These three areas of experience influence the racial socialization messages present in families. Mainstream experiences are focused on the dominant culture and may contribute to either saying nothing about race or providing egalitarian messagesthat emphasize equality and harmony across race. African American adolescents who receive egalitarian messages are associated with fewer problem behaviors and higher psychological well-being. Cultural experiences are related to group values, practices, and traditions. The most common type of racial socialization message are racial pride messages, which emphasize the positive aspects of one’s racial/ethnic group. More frequent racial pride messages are positively related to academic motivation, academic achievement, and self-concept and weaken negative associations between racial discrimination and grades. On the other hand, negative messagescan also reinforce stereotypes about one’s racial group. Negative messages are associated with problem behaviors, depressive symptoms, and lower psychological well-being among African American adolescents. In addition, cultural messages include implicit behavioral messages. These include engaging in activities or having culturally relevant items related to one’s ethnicity or racial group in the household. Behavioral messages are associated with fewer depressive symptoms and higher psychological well-being among African American adolescents. Minority experiences encompass exposure to oppression and the development of coping skills to deal with discrimination. Racial barrier messages address this realm of experience and are messages about potential challenges due to racial or ethnic group membership and how to cope with those obstacles. Data for this study come from a multiwave study of 1,590 adolescents recruited from three school districts in a Midwestern metropolitan area. The current study used the first way of survey data, collected in the 2010-11 to 2013-14 school years, of a sample of 1,363 adolescents (6th to 12th graders) who self-identified as Black or African American. Latent profile analysis was used to identify parenting profiles. Then, structural equation modeling was employed to examine the relationship between the parenting profiles and racial discrimination experiences on academic and psychological outcomes for African American adolescents. Moderate positive parenting (n=767): characterized by moderately high involved-vigilant parenting; moderately high levels of racial barrier, racial pride, behavioral, and egalitarian messages; and low levels of negative messages. Unengaged parenting (n=351): characterized by moderately low involved-vigilant parenting and low racial socialization messages. High negative parenting (n=242): characterized by moderately low involved-vigilant parenting; high levels of negative stereotypic messages, and moderate levels of other racial socialization messages. 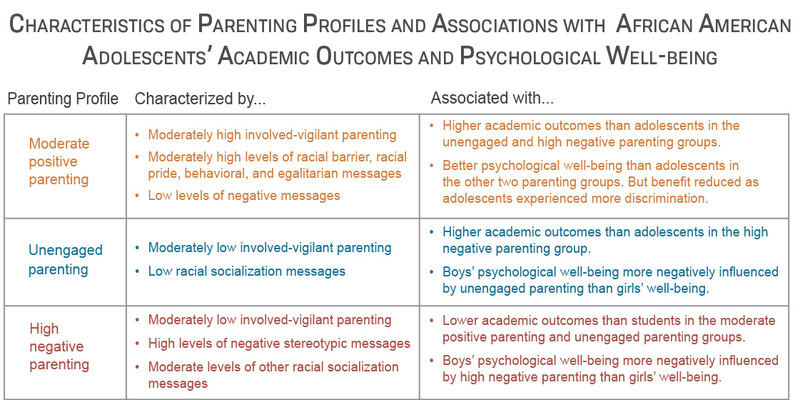 Boys, older adolescents, adolescents in predominately African American schools, and adolescents who reported more frequent discrimination were overrepresented in the high negative parenting group. Adolescents in the moderate positive parenting group had higher academic outcomes than other adolescents while adolescents who received unengaged parenting had higher academic outcomes than those in the high negative parenting group. Adolescents in the moderate positive parenting group had better psychological well-being than adolescents in the unengaged or high negative parenting groups. But the benefit of moderate positive parenting reduced as adolescents experienced more discrimination. While unengaged and high negative parenting (vs. moderate positive parenting) were related to lower psychological well-being for all adolescents, boys were more negatively influenced by unengaged and high negative parenting. Overall, the results suggest that adolescents benefit psychologically when they receive positive racial messages in a context of supportive parental involvement, even when they experience racial discrimination. School counseling personnel should have cultural competence and consider the roles of racial discrimination and racial messages on African American adolescents’ academic and psychological outcomes. These experiences and messages matter across different types of racial compositions. Even in predominately African American schools, these racial experiences are relevant to African American adolescents’ well-being. African American boys may need additional support from school psychological services and from teachers due to their high risk of experiencing discrimination, higher likelihood of receiving negative racial messages in combination with less involved parenting, and their greater vulnerability to negative parenting. Racial discrimination can undermine some of the positive effects of positive parenting. Schools and other organizations and institutions that interact with African American adolescents and their families should listen to parents’ and students’ concerns about discrimination in their organizations, evaluate their racial climate, and work toward creating inclusive environments in order to remove barriers that harm adolescents directly and weaken the positive influences of positive parenting. Varner, F., Hou, Y. Hodzic, T., Hurd, N. M., Butler-Barnes, S. T., & Rowley, S. (2017). Racial discrimination experiences and African American youth adjustment: The role of parenting profiles based on racial socialization and involved-vigilant parenting. Cultural Diversity and Ethnic Minority Psychology. Varner, F., Hou, Y. Hodzic, T., Hurd, N. M., Butler-Barnes, S., T. & Rowley, S. (2017). Parenting patterns, racial discrimination, and African American adolescents’ psychological and academic outcomes. PRC Research Brief 2(15). DOI: 10.15781/T2H41K36R. Fatima Varner (fvarner@utexas.edu) is an assistant professor of human development and family sciences and a faculty research associate in the Population Research Center, The University of Texas at Austin. Yang Hou is a graduate student in human development and family science at The University of Texas at Austin. Tajma Hodzic is behavior therapist at North Shore Pediatric Therapy and a graduate student in applied behavior analysis at The Chicago School of Professional Psychology. Noelle M. Hurd is an assistant professor of psychology at University of Virginia. Sheretta T. Butler-Barnes is an assistant professor of social work at the George Warren Brown School of Social Work at Washington University in St Louis. Stephanie Rowley is a professor of psychology and education at University of Michigan. This research was supported by the National Science Foundation (Grant 0820309) awarded to the Center for the Study of Black Youth in Context and by Grant R24HD042849, Population Research Center, awarded to the Population Research Center at The University of Texas at Austin by the Eunice Kennedy Shriver National Institute of Child Health and Human Development.